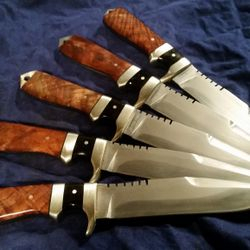 All of my blades are hand forged, hand ground, and hand finished in my one man shop... there are no jigs or patterns used in the making of my blades. They are 100% hand-crafted. 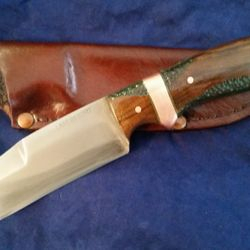 Each custom blade is made specifically for it's owner. From the size of their hands to being heat treated in the manner best fitting its intended purpose. 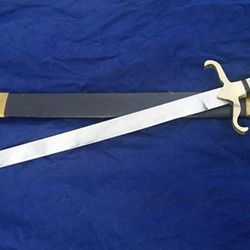 Each blade is unique to it's purpose and owner. 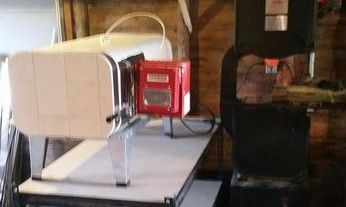 After working on her off an on for almost three months my new forge press if finally complete and set up in the shop. 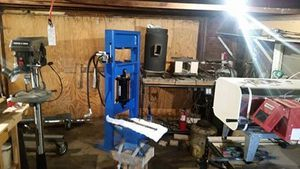 From doing everything with a hammer this is a big upgrade that will enable a huge labor savings and greater reliability in forge welding. 11/27/2016 - Now offering S7 and W2 tool steels. Expanding my steel selection even further I am now offering S7 and W2 tool steels. For those who haven't heard of S7, it is the Abrams tank of blade steels. S = shock resistant and is the steel of choice in industrial settings for cold forging dies. Essentially it has extreme shock resistance at high hardness. As for W2, it has performance performance comparable to 1084/1095 simple steels, but takes an even better hamon and is my new steel of choice for differential heat treats. A new addition to my destructive testing tools. A Shephard Fracture Grain Analysis set. Short version. 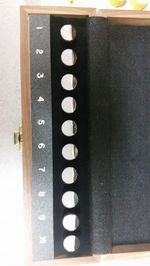 This is a laboratory grade fracture grain standards set. 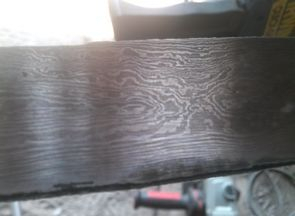 This will be used to compare the grain structure of my knives to after destructive testing. 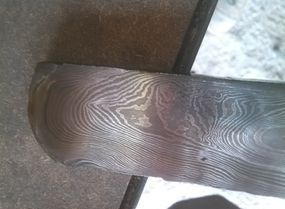 Just another link in the chain of quality control to ensure the toughest best edge holding blades that I can possibly make. 10/22/2016 - New Heat Treat Oven. I've had thermal controls in my forge since go but that only allowed for blades up to 14"... now I can guarantee exacting temp control in blades up to 26". The metal cutting bandsaw will be a useful for cutting patterns in damascus billets when I bring home my new 30ton press in a few weeks. 1/06/2016 - Forge Expansion! D2 and AEB-L added to our steel selection! After a long winter of process and destructive testing with my new cryogenic (liquid nitrogen) setup and Skut electric kiln I am excited to be adding D2 and AEB-L to my steel offerings. 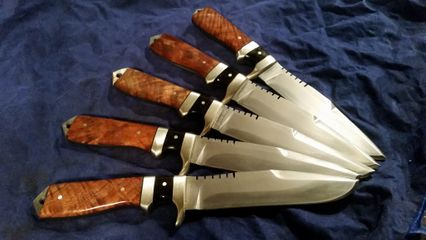 8/25/2015 - Damascus Now Available for Your Custom Needs! 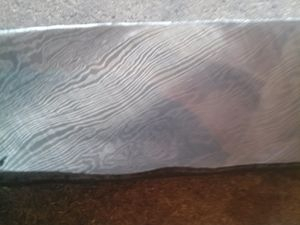 Spent a long weekend making Damascus with my good friend Ed Caffrey's and now have a goodly stock for your custom blades or fittings. All are made from 1084/15n20. -328 layer hammer forged random. 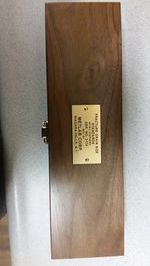 7/31/2015 - Now Custom Engraving! 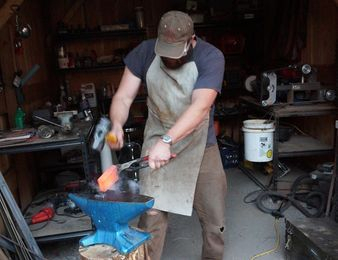 3/31/2015 - Forge Expansion Progress.... HALF WAY THERE! After much tinkering and testing I have finally gotten new forge and the first low temp salt bath refined and working with precision. I now have exacting thermostatic control for heat treating and austempering blades up to 13 inches. 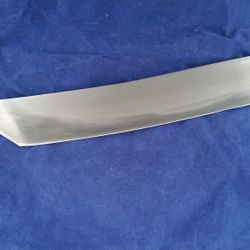 Phase two (a large heat treat oven and salt bath for blades up to 48inches) should move more quickly now that I have a handle on the techniques and technology. Due to a demand for larger blades which my current set up does not accommodate. I am upgrading the forge to include a large heat treat oven and low temp salt baths. This expansion will enable not only better control during heat treating but also increase my max blade size to 48 inches. 11/01/2014 - We now have true L6 steel in stock! For those who don't know what that means. 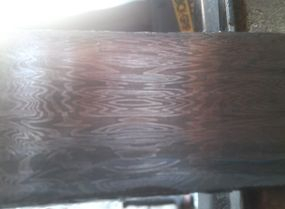 L6 is almost universally renowned as the BEST blade steel in the world and is very difficult to come by in blade stock. 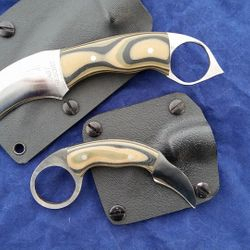 It is the blade steel of choice of the worlds top oriental bladesmiths. Get your custom L6 blade before it's gone.